So … what is that wise and tested prescription that will enable us to fight against the onslaught and the emotional damage that depression inflicts upon an unsuspecting person’s mind and heart? * - See your medical doctor. * - Talk to a trained, professional counselor. * - Read your Bible every day. Memorize a verse a month or a verse a week. * - Worship! Worship Loudly! Worship Often! But let me just say … I am not done giving you your healing instructions about the commitment to worship just yet. Would you allow me tutor you on a deeper level concerning how the choice to worship has the exciting power to cleanse your thought life … holds the divine prescription that will heal your emotions … and … has the definite possibility of changing the very way that you process your situations? I believe that breaking out in song and worshipping the Lord, in spite of one’s circumstances, is a theme in Scripture from Genesis through Revelation. But the story that I love most of all is the account of King Jehoshaphat as told in II Chronicles 20. King Jehoshaphat and his nation of Judah were being attacked by three enemy nations that were ferocious and vicious fighters. The enemy forces that were coming toward Judah possessed overwhelming numerical superiority. Have you ever been attacked by something that you knew you were absolutely no match for? Cancer? Divorce? Addiction? The military forces of the nation of Judah were absolutely no match for the armies that were invading their land. In the natural, there was no way that Judah could win … they were about to be slaughtered! Have you ever felt like you were about to be absolutely slaughtered by depression? By discouragement? By bitterness? By anger? King Jehoshaphat gathered the entire population of his country and they sought help from the Lord! They didn’t “google” how to destroy a massive army … they didn’t post their despair on social media … they didn’t pull out the tissues and buy chocolate! This desperate nation and this wise king sought help from the Lord! The Bible tells us that they fasted … they prayed … they gathered in the house of the Lord … and they declared that their eyes were not on the enemy nations but their eyes were on the Lord! And then what did this soon-to-be-annihilated people group do next? What do you do when you are all out of options … when your circumstances refuse to change … and when you know that you are about to be defeated? What do you do?! I believe that you should do what King Jehoshaphat and the entire nation of Judah did at the worst moment of their life! Now remember … these people didn’t know what was going to happen next! All they knew was that they were in serious trouble! They were wondering if their homes were going to be pillaged … if their livestock was going to be destroyed … if their wives and daughters were going to be raped and murdered. In the natural – they didn’t see any reason to praise the Lord but they worshipped Him in spite of their emotional pain and fear! I can do no less at the worst moment of my life! As believers in Jesus Christ, we must not allow our circumstances to steal our song! We must not allow depression to deprive us of the healing power of worship! You will not “think” your way out of a battle … you will not “eat” your way out of destruction … you will not “shop” your way to victory … you will not “weep” your way to advantage. You will worship your way out of the battle! You will worship with a very loud voice! I remember one Sunday morning when I was in deep, deep emotional pain. My world seemed to be crashing in around me and there was absolutely nothing I could do to change my heart-breaking circumstances. As I stood in the congregation with 100’s of others, I decided to lift my hands to heaven even though I didn’t “feel” like it in the natural. The worship team was between songs … and suddenly … one of the team members with a powerful, soaring voice broke out into “Great Is Thy Faithfulness”!! The congregation listened while she touched heaven with her worship. And although I was weeping … I knew that I knew that I knew that I did believe. 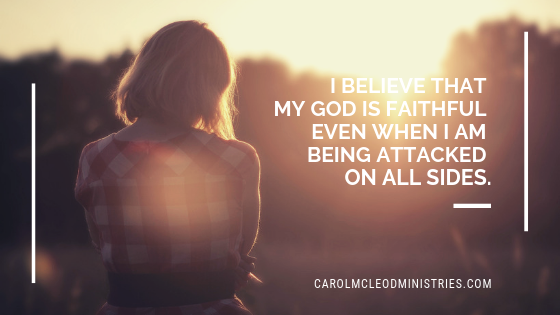 I believe that my God is faithful even when I am being attacked on all sides. I determined in that dark, yet promising moment, that I would sing in spite of my pain. I would sing in spite of my hurt. I would sing in spite of my questions. I can’t sing for you … only you can make that choice … but I can guarantee you that you will never regret your decision to worship in spite of deep emotional pain.